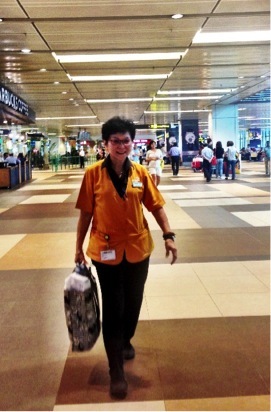 There is some magical energy she exuberates as she goes about her job at the Changi International Airport Terminal 1. 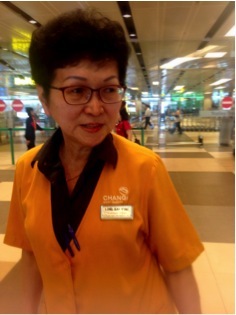 Madam Pauline Long Lai Ying is one of our many workers behind THE PRIDE OF THE INTERNAL STATURE. The small-framed bespectacled lady with a dash of light pink lipstick, donned in her uniform is a pleasant personality. At 67 years old, the Cleaning Supervisor who works for 800 Super Waste Management Private Limited is an active worker. Try walking with her as she strides from the storeroom to inspect the collection of her tools of the trade by cleaners under her charge, to the next restroom for monitoring. I bet you will find yourself pacing up to keep up with her strides. All you may see is a senior citizen making a living as a cleaner. But her life, like that of most cleaners, is beyond just ‘making a living’ out there. They too have dreams and aspirations. The soft spoken mature worker had to venture out into the cleaning industry at the age of 62. Before that, she was working as a factory worker. When she was retrenched from the job she was comfortable with, she had to accept this job that came her way. She admits thinking over many times before accepting the job. “At my age, if I was going to start work as a cleaner, I felt somewhat ‘paiseh’ because I already knew people were looking down at this profession,” she says. Still feeling very apprehensive on her job, Madam Long admits she was still wary of her surroundings as she carried out her task. This apprehension changed the day she witnessed something which gave her some motivation. There was a lack of manpower on one of the days, and her superior at work did not hesitate to carry out the roles of the cleaners. She wasted no time in picking up litter and scrubbing the floors. “If she can do it, why not me,” was what she felt, she says. There are other moments at her workplaces that have given her doses of motivation. She has now grown accustomed to her job, and has developed a sense of pride in it. She now walks with her head high up. So much so that she takes the long travel distance from her home in Jurong to her workplace in the east in her own stride. She wakes up at 4am and takes the train train to Joo Koon station from the Lakeside station, which is the station nearest to her home. She does this so that she can get reserved seats. Once settled, Madam Long dozes off, not forgetting her alarm clock set on her phone at 6.20am. This is so she gets in time, with some buffer, before she reaches the Changi Airport station at 6.50am. Madam Long has a strong appetite for learning. Some years ago, she signed up for courses at NTUC’s e2i (EMPLOYMENT AND EMPLOYABILITY INSTITUTE) on her own initiative. With very little education like many of her peers, Madam Long yearns to speak good English. The WORKFORCE SKILLS QUALIFICATIONS (WSQ) IN CLEANING and CONVERSATIONAL ENGLISH, as well the CERTIFIED SERVICE PROFESSIONAL (CSP) are some of the certificates she holds on to proudly. And she still wants to continue learning. She is looking for an opportunity to sign up for the intermediate course too. And to brush up on her English, she speaks the language to all the cleaners under the charge. “As a Cleaning Supervisor, I have a responsibility. I want to keep learning new things because I have started to love my job. I am happy on my job now; but I will be even happier if more people appreciate our jobs and treat us better,” she says. Know what I’m thinking? I used to think that minimum wage would be good for the low wage workers in Singapore. I had thought that if the government would step in and stipulate a minimum wage for, say, cleaners, then at least the cleaners would have some income security. I’ve changed my mind since. You see, MINIMUM WAGE BECOMES THE MAXIMUM WAGE. BUT CLEANERS, TOO, ARE PEOPLE WITH DREAMS AND ASPIRATIONS, no different from you and me. So if we are constantly looking for better job prospects, for promotion, for pay increase, why would the cleaners be any different? Surely they, too, can do their work better and handle more complex work, or operate cleaning machines, if they are given the training? What about those who want career advancement and perhaps want to manage a small team of cleaners? A minimum wage system cannot solve this problem as it is too blunt, too one-dimensional an instrument. THEN I HAD MY EUREKA! 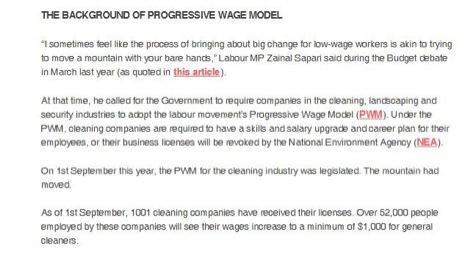 MOMENT AS I REALIZED WHY NTUC HAD LOBBIED FOR PROGRESSIVE WAGE MODEL FOR THE CLEANING SECTOR. The Progressive Wage Model (PWM) is more than minimum wage. It’s a model that benefits the lower-income workers continually throughout their working lives. I like how the Progressive Wage Model is a ‘step-up and move-on’ model. First, the cleaners get a salary increase to their base salary – the ‘step-up’ part. Next comes the career ladder that provides them with training and skill upgrade. With better skillset, they can move up the ladder and earn more – the ‘move-on’ part. See why I’m now a convert?